Here is another all in one from Epson, it comes with individual ink cartridges and very good quality print outputs, making it a good, reasonable and cost effective printer to operate. Epson Stylus SX125 comes with a maximum print resolution of 5760 x 1440 dpi, the prints are of a very good quality and are produced using 4 Epson Stylus SX125 ink cartridges. Having separate cartridges greatly reduces operating costs, as only the colour cartridge that gets empty is replaced. The print speeds are 28 ppm for monochrome prints and 15 ppm for colour prints. A 10 x 15 cm photo takes 89 seconds to be printed, which given the excellent photo quality is reasonable. The scanning resolution for Epson Stylus SX125 is 600 dpi x 1200 dpi, while the prints come out really good, the same cannot be said about scans and photocopies. The printer has one single input tray that can handle up to 100 sheets of maximum A4 size. This is a very lightweight and compact printer, weighing less than 4 kg. Connectivity is only through USB, limiting its use over networks. The software bundles that Epson gives along are very versatile. From a FineReader to convert scans into texts, to epson Easy Print that makes editing and printing photos a breeze, these makes this a very capable printer. Easy Print even reduces red eye and touches up faded photos. Epson Stylus SX125 is a all in one that gives very good quality of prints at a very reasonable price. Its scanning abilities can be ignored for the excellent print results it gives. Overall, it is a good option to be had at your home or small office. Q. How to solve various printing issues that occur while printing through Epson Stylus SX125 printer? The printing issues mostly occur when one is using old dried out Epson Stylus SX125 ink cartridges for their printer. Various issues like light, faded or smeared prints, getting low quality printouts with improper colours and many more such problems occur when the cartridges become old or damaged. Try the solutions below to resolve such type of printing issues. Always make sure that the printable side (the whiter or glossier side) of the paper is facing up in the right direction. Clean the clogged printheads to get rid of the issue associated with the printing. Align the printheads from maintenance in the setup menu on the LCD panel. If the quality is not improved, try aligning them using the printer driver utility setup. Refer your online user guide to align the printheads. For good results, use the ink cartridges within six months of opening the package. Try to use good quality Epson Stylus SX125 ink cartridges and paper as recommended by Epson. Make sure that you have selected the correct paper size, layout, and reduce/enlarge setting in each print settings menu for the loaded paper. If the edges of the copy or photo are cropped, move the original one slightly away from the corner. Clean the document table. Refer your online user guide for more reference. Q. How is the quality of printouts from an Epson Stylus SX125 printer? A. Epson Stylus SX125 printers can produce very good quality printouts that will leave you satisfied after every use. They are capable of printing up to a resolution of 5760 x 1440 dpi. Q. Will using compatible Epson Stylus SX125 ink cartridges void my printer’s warranty? A. Absolutely not! Our compatible ink cartridges are of excellent quality, that have been FSC tested and certified. Using them with your printer will not cause any problems and will not void your printer’s warranty. Q. How do I check how much ink is remaining in my Epson Stylus SX125 ink cartridges? Open the Epson Printer Utility 4 dialog box. Click on Epson Status Monitor. A graphic displaying ink cartridge levels from when you first opened the status monitor will be shown on screen. Click on “Update” to see the current ink level remaining in your ink cartridges. A. Epson Stylus SX125 printers are small and compact which makes them easy to fit anywhere and take up less space. They also produce high quality printouts. This makes them suitable for home purposes. Epson Stylus SX125 printers also support scanning and have a 4 ink cartridge system which further reduces operating costs. These features enable this printer to be used in small offices also. Q. Will Epson Stylus SX125 ink cartridges also work with an Epson Stylus Dx3850 printer? A. No, Epson Stylus SX125 printers use a different model of ink cartridges that are not the same as Epson Stylus Dx3850 ink cartridges. You can find ink cartridges for Dx3850 printers as well on our website. 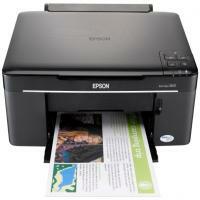 A list of printers compatible with Epson Stylus SX125 ink cartridges is mentioned here. Q. My printouts are missing colour or black print. What can I do? Further keep in mind that your printed colours can never exactly match your on-screen colours. Q. What operating systems does the Epson Stylus SX125 printer is compatible with? A. The operating systems that the Epson Stylus SX125 printer is compatible with are Apple Mac OS X 10.4.11, MS Windows 7, MS Windows Vista, MS Windows XP and MS Windows XP Professional x64 Edition. Q. What are the dimensions of the Epson Stylus SX125 printer? What is the media feeder capacity offered by this printer? A. The Epson Stylus SX125 printer is 17.2 inches in width, 12.0 inches in depth and 5.9 inches in height. The capacity of the input tray is 100 sheets and that of the output tray is 50 sheets. Q. I have received the Epson Stylus SX125 ink cartridges but they do not fit into my printer. Could you please suggest the probable reason for this? A. If the ink cartridges do not fit into your printer, please ensure that you have ordered these cartridges for the correct printer model. Please check that the instructions for the installation and all the clips have been removed before their installation. If you still face any problems then you can contact us. Q. What are the advantages of the Epson Stylus SX125 printer? Q. Is it necessary to keep ink cartridges in room temperature conditions so they become warm before being used? I need to know it for the Epson Stylus SX125 ink cartridges I’m about to change. A. Please make sure that you always let the ink cartridges warm up at room temperature for minimum three hours prior to using them. Q. Should I keep the Epson Stylus SX125 ink cartridges with their labels facing upward or downward? A. Please note that all ink cartridges are to be stored with their labels facing upward. Avoid keeping them upside down. Q. While changing the Epson Stylus SX125 ink cartridges in my printer, the print heads did not move to change position. What should I do? A. You need to press the Red ink button on your printer in this case. Q. I got a prompt to update my printer’s firmware (I use Epson Stylus SX125 printer) but I ignored. Is that okay or should I have accepted? A. If you are using compatible ink cartridges for your printer and wish to continue with it, then please don’t update the firmware. It is also advisable to turn off auto updates in your printer's software options. Q. I need to change the Epson Stylus SX125 ink cartridge (T1285) for my Epson Stylus SX125 printer. In what way exactly should I place the ink cartridge into the cartridge holder and what should follow next? A. Please place the ink cartridge with the bottom down and then push it down till you hear it click into place. Q. I got the message ‘Epson ink cartridges cannot be recognised’ while using my printer (Epson Stylus SX125) and I’m not able to print. What has happened and what should I do? Remove all the ink cartridges from the printer. Turn off the main switch of the printer at least 20 minutes. Turn the main switch on, then switch on the printer and reinstall the ink cartridges. When you open your printer, please also check whether the small microchips on the cartridges are clean. If they aren’t, clean them gently. Q. I ordered for Epson Stylus SX125 ink cartridges but they arrived in a leaky condition. What should I do? A. Contact Epson Support right away. Don’t open the inner plastic packaging of your Epson Stylus SX125 print cartridges as it may nullify your claim to get a replacement. Q. I have an Epson Stylus SX125 printer. Currently, I’m not using the 'Black Ink Only' or 'Grayscale' setting but wish to select this while printing colour documents. Where can I do this? I have Windows 7 operating system in my PC. A. If you want to print in black, you need to select the 'Black Ink Only', 'Grayscale' or 'Black' print mode option in your printer driver. To access this option, please click the Start button and then go in Devices and Printers. You can also type device in the Start Search box and press Enter or click on Devices and Printers. Q. When I bought Epson Stylus SX125 printer along with full cartridges, I noticed that the number of papers printed by it was lesser than how much the printer at my office prints. Was the ink cartridge loaded with less ink? Can I complain about it? A. When you use a printer for the first time, some ink from the first cartridges installed is utilised to prime the printer. That happened as your printer was new. You can rest assured that from the next time, you’ll get more number of printouts. Q. I installed Epson Stylus SX125 ink cartridges in my Epson printer. The cartridges had actually been stored for over four months. Is that the reason why the printouts aren’t very clear? What should I do?